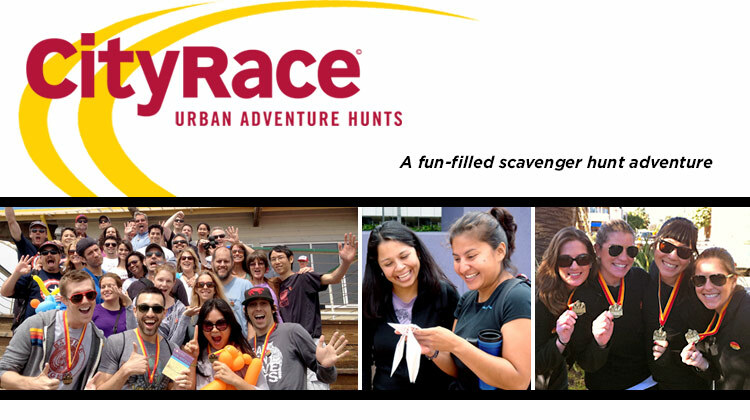 Most of our CityRace Urban Adventure Hunts are available as private events. Details are below. Escape Room LA, our real-life room escape game in downtown Los Angeles, is also available for team building and private group events. See the Escape Room LA website for more info. Planning an extra-special birthday celebration, a teambuilding event or a fun day out of the office? Maybe you'd like an exciting way for you and some friends to have a fun and challenging new experience! You'll have the whole hunt just for your group! We can include several custom designed clues that include fun facts about a birthday celebrant, that relate specifically to your company, or to any other topic you like. Hunts are typically about 3 1/2 hours but can be shortened if you prefer. Everything is done on foot within a compact area or neighborhood. Members of the winning team will each receive a winners' medal and prizes such as books and/or gift cards. We can provide CityRace t-shirts for your entire group at an additional charge, or we'll work with you to find special prizes that fit your budget and goals. A minimum of 20-30 people is required for a CityRace private event. Discounted group pricing ranges from $20-$30 per person, depending on your total group size. For more information and a price quote, please e-mail us or call 213-689-3229.